The 2015 Toyota Highlander features an exceptional, roomy interior, high-end technologies and a beautiful exterior design. 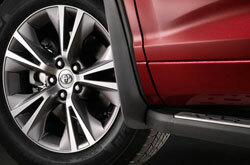 Wraparound headlamps, a low roofline and a firmly fitted trapezoid-styled grille give the SUV a sleek look. This styling is carried out on both the standard Highlander and Hybrid model, which each offer a series of excellent features for the 2015 model year. Both editions come with incredible powertrains as well; read about them in our 2015 Toyota Highlander review below. 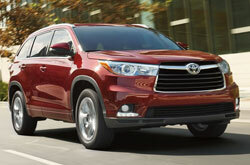 Coming into the new model year, the standard 2015 Toyota Highlander in Evansville is available with two powertrains: a 2.7L four-cylinder and a 3.5L V-6. Offered on the front-wheel drive LE trim, the 2.7L four-cylinder produces a reported 185 horsepower and features a six-speed automatic transmission. It also delivers an EPA-estimated 22 mpg combined, 20 mpg city and 25 mpg highway. The V-6, which is outfitted on all other models, exerts 270 horsepower and 248 lb.-ft. of torque. It also comes with a six-speed automatic transmission that supports its performance capabilities. For those who want top-notch fuel efficiency, the Hybrid is the best choice. Its system, which is paired with a 3.5L V-6, outputs 280 horsepower and produces an outstanding EPA-estimated 27 mpg city, 28 mpg highway and 28 mpg combined. 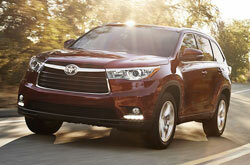 In addition to its range of powertrains, the 2015 Toyota Highlander in Evansville offers great technologies. A Driver Easy Speak system (on XLE and Limited) allows drivers to talk to passengers in the back seat by utilizing a mic that carries their voice to the rear speakers. This is a great way for parents to communicate with their kids during long trips or when needed. Aside from this fantastic feature, the XLE trim comes with a moonroof, Entune Audio, Bluetooth, heated front seats, push button start and leather-trimmed seats. An eight-way adjustable power driver's seat is also fitted in the car for maximum comfort. If you're interested in learning more about the latest Highlander, continue browsing our 2015 Toyota Highlander review for details. The 2015 Dodge Durango, Buick Enclave, Honda Pilot, Ford Explorer, GMC Acadia and the Chevrolet Traverse are no match for the 2015 Highlander! Just compare Toyota's latest model next to them and you'll find out that it trumps the competition easily. Shoppers will be won over by the Highlander's cut-rate price, as well as its superb styling. Compare its price to the vehicles listed above and you'll see that it's a truly amazing value, which is one of the main reasons why so many Evansville drivers select it. Check out our Quick List underneath this text for more info about its specs! We've taken the time to create reviews about vehicles like the 2015 Toyota Highlander because we know how important it is to your car search. Because it's uncommon to get reviews with up-to-date? specs on dealer sites, we've made it our mission to provide reviews from skilled writers. This Toyota review contains factual information about the Highlander and it's specifications, safety technologies and more. Not sure if the Highlander is tailor made for you? Check out our online research index to read more Toyota reviews and to compare Kenny Kent Toyota's models to vehicles from other auto manufacturers.